News NWI Catholic – Hey U.G.L.Y. MICHIGAN CITY – Bullies are nothing new. For ages, schools have been testing grounds for those who feel a need to assert their misperceived strength or superiority by choosing one or two unfortunate souls as targets of their unfounded aggression. There was a time gone by when teachers and parents might have shaken their heads, saying, ‘kids will be kids.’Ãƒâ€šÃ‚Â Those days are gone. As the current culture becomes increasingly numb to brutality in many forms and school violence continues to escalate, parents and administrators alike struggle to find a solution to the problem. At St. Stanislaus Kosta, 17 sixth-grade students have taken a leadership role in an effort to create awareness and stop the practice of bullying cold in its tracks. As part of the Unique Gifted Lovable You, or Hey UGLY, program, this middle school task force launched a school-wide initiative on May 13 geared toward empowering students to step up and take control. According to the Centers for Disease Control, more than 864,000 teens miss at least one day of school each month because they fear for their safety. A study by the National Youth Violence Prevention Resource Center States that 5.7 million children have bullied or been bullied. Bullying can take many forms, from verbal to emotional, as well as physical. In light of developing technology, bullies now employ modern tools, such as the Internet, email, camera phones, online social networking sites and text messaging, which can provide an insidious veil of anonymity. Bryant was attracted to UGLY because of its dedication to helping students of all ages overcome issues of self-esteem and the bullying that can happen as a result. Bullies hide their behavior well, ensuring that the teacher cannot always observe the behavior, said Bryant. Parents of students accused of bullying often do not believe that their child is even capable of this mean behavior. Gathering in the school gymnasium, members of the student task force addressed the assembly. “Bullies feel scared so they feel the need to hurt others with their words or actions,” said Darria Burt. Following the presentation, each of the school’s 170 students stood before a task force member to take a pledge: “I promise to stop bullying and respect other’s feelings.” Students then created a large banner with cutouts of their hands as a continued reminder of their pledges. According to Carrie Miller, a St. Stanislaus middle school teacher and project facilitator, the task force will reinforce its message with classroom visits, which will include various self-esteem and diversity awareness activities. 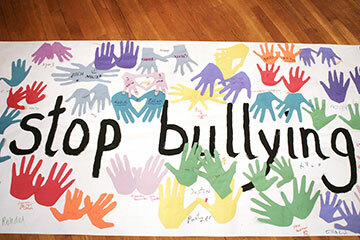 They are also sponsoring a school-wide essay and art contest on the effects of bullying. Hey U.G.L.Y., a not-for-profit organization, was designed to give children and teens struggling with the effects of low self-esteem the tools needed to counter bullying, eating disorders, other forms of violence, substance abuse and suicide. Betty Hoeffner, president and co-founder, was present at St. Stanislaus to watch students take their pledges. Inspired by a teen who came to Hoeffner after failed suicide attempts, the advocate for youth embarked on developing a program that would enable children and teens to learn to feel good about themselves. And when it came to bullying, Hoeffner was able to draw on personal experience. The Hey U.G.L.Y. 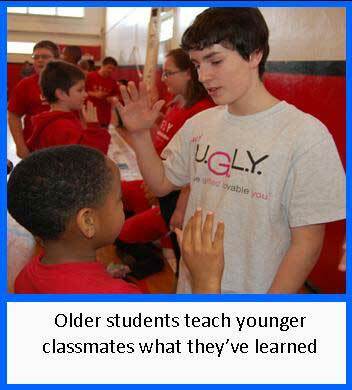 program has now reached out to more than 650,000 youth through in-school presentations and activity plans. “I hope our program stops bullying because it hurts people, even the bully,” said Martin Lomay, a team member. Despite the fact that victims of bullies often are made to feel isolated and marginalized, according to the bullying task force, one of the strongest deterrents to this behavior is the old adage – strength lies in numbers.